June 13th - 18th 2018. 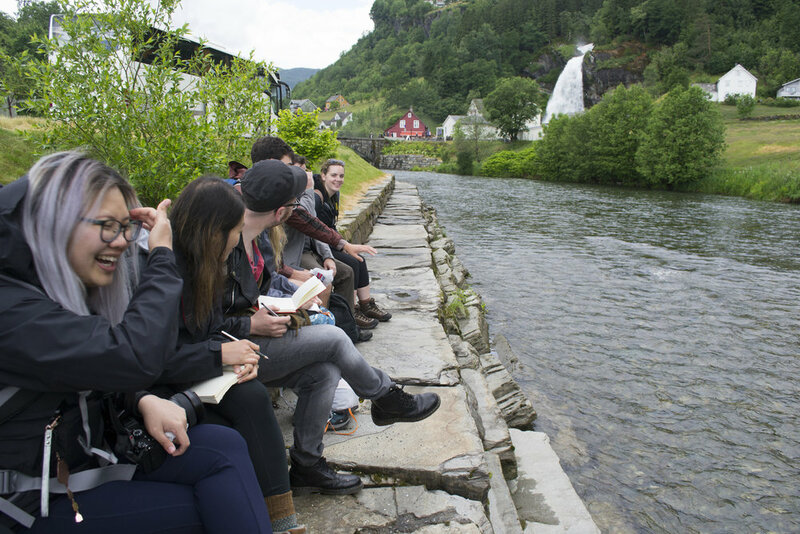 The Light Grey Norway Creative Residency Program emphasizes connectivity, discovery, and learning together in a natural space fit for introspection and innovation. 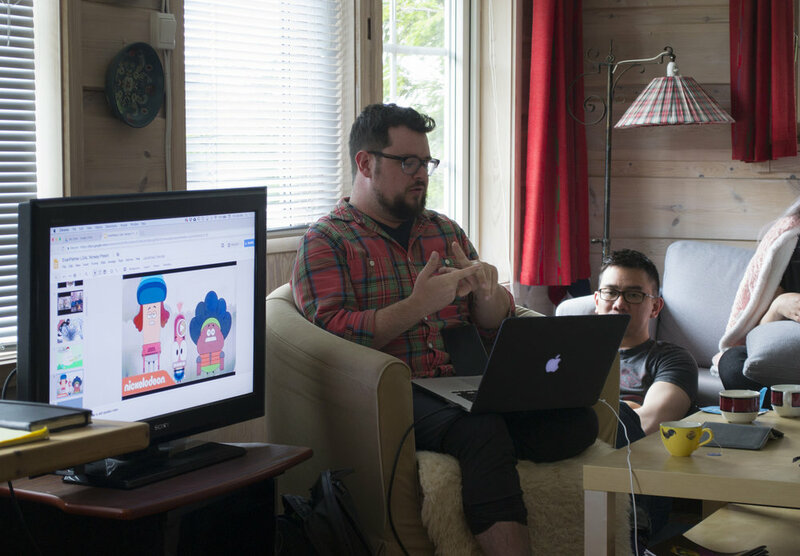 Team Sol includes a diverse group of illustrators, designers, craftsmen, fine artists, photographers and more. Team Sol residents hail from various areas of the United States and Canada, Scotland and the Philippines. Through the program, artists embarked on a journey of discovery, collaboration and inspiration, surrounded by one of the most breathtaking landscapes in the world. 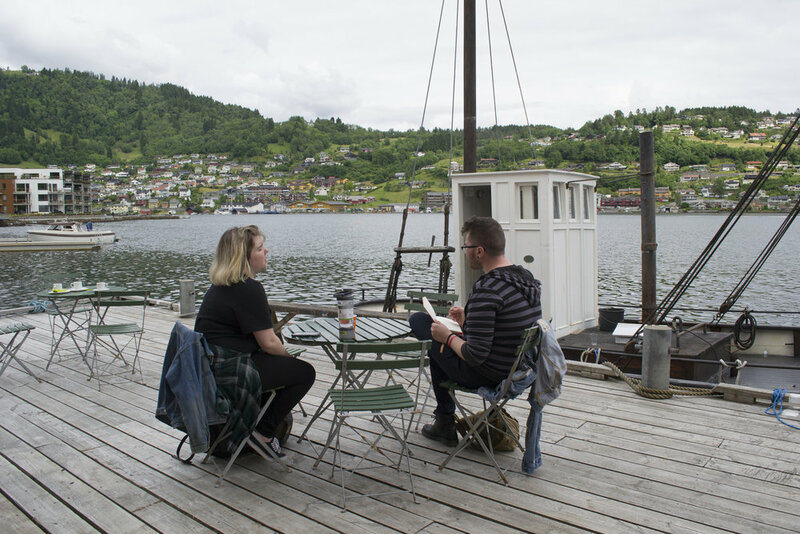 By day, artists traveled along the Hardangerfjord in handmade boats, hiked through coniferous forests, swam in natural springs, and wandered through the cobblestone streets of Bergen. 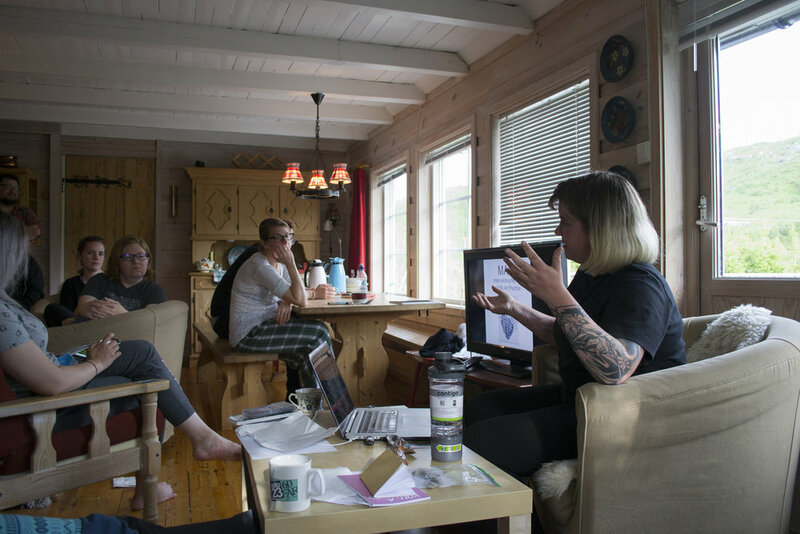 At night, artists gathered for conversations, lessons, and workshops about creative practice and growth. Read more about our 2018 artists-in-residence teams below. Molly Fehr is an illustrator and Graphic Designer hailing from the suburbs of Philadelphia. Her work is heavily based in fantasy and fairy tales, and often includes tons of plants and probably a princess or three. Upon graduating from Pratt Institute in Brooklyn, NY, with a degree in Communications Design, she moved to San Francisco to take part in the year-long Chronicle Books Design Fellowship. 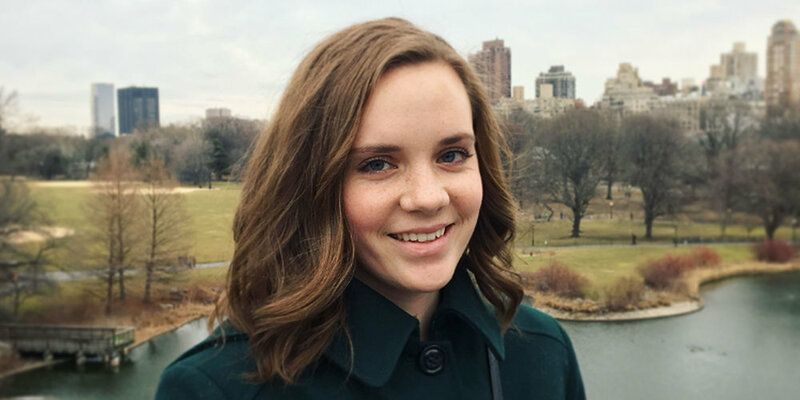 These days she’s back living in the Big Apple, designing young adult, middle grade, and picture books at HarperCollins Publishers and freelance illustrating mostly for the publishing industry. When Molly's not creating, you can usually expect her to be catching up on her reading or spending time in nature. Josh McKenzie is a storyboard and comic artist located in Los Angeles. He has his BFA in Illustration from Northern Michigan University, and he loves cartoons more than anything. When not drawing, he likes detectives, giant robots, monster boys, and any intersection therein. Bailie Rosenlund graduated from Sheridan's BA Illustration program in Oakville, ON Canada in 2016. 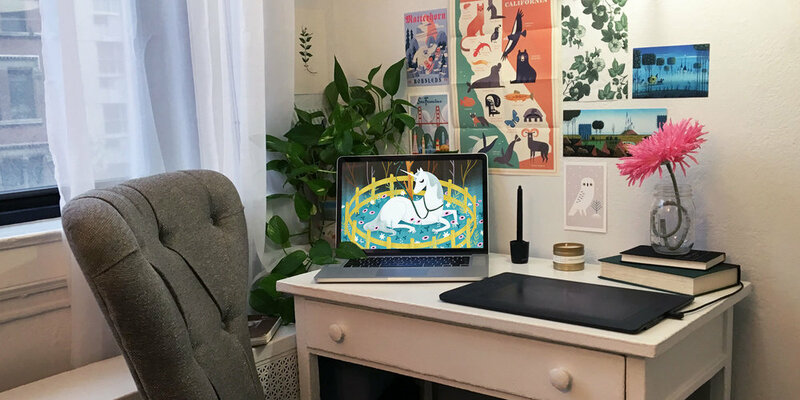 She is an award-winning illustrator who is currently working in Toronto Animation and freelance illustration. In addition, she is illustrating an ongoing graphic novel series Les Piggies with her friend and colleague, Kari Lynch. She enjoys drawing various subjects, but her work is most influenced by the fantasy genre and gothic literature. She is currently illustrating her own Tarot deck. When Bailie isn't working on art, she can often be found making tea, researching historical warrior women, or reading comics. Ginnie Hsu is an Illustrator, a Designer, an Educator and a Maker living in Starkville, Mississippi. Her work is often inspired by my everyday life, nature, human living, and well-being. She loves mixing new and traditional media to create magic. Issel is a freelance illustrator from Manila Philippines. 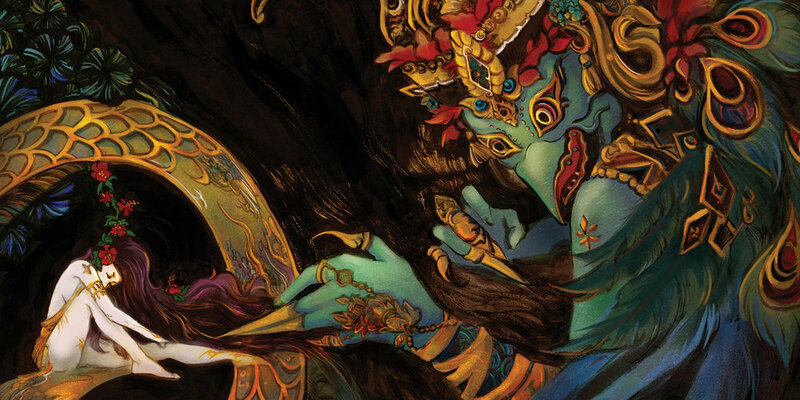 She graduated with AB-Animation and continued her studies in SCAD Hong Kong with a BFA in Sequential Arts. She is described as a ball of sunshine who loves fantasy, diverse cultural folktales, history, cartoons, mundane life. Basically anything that she finds fascinating and worth sharing. Thankfully she can put all of these interests in a concoction called comics and illustration. Jay is a scientific and editorial illustrator based out of Boise, ID. He earned his BFA from Minneapolis College of Arts in 2013 and his certification in Scientific Illustration from California State University: Monterey Bay in 2016. 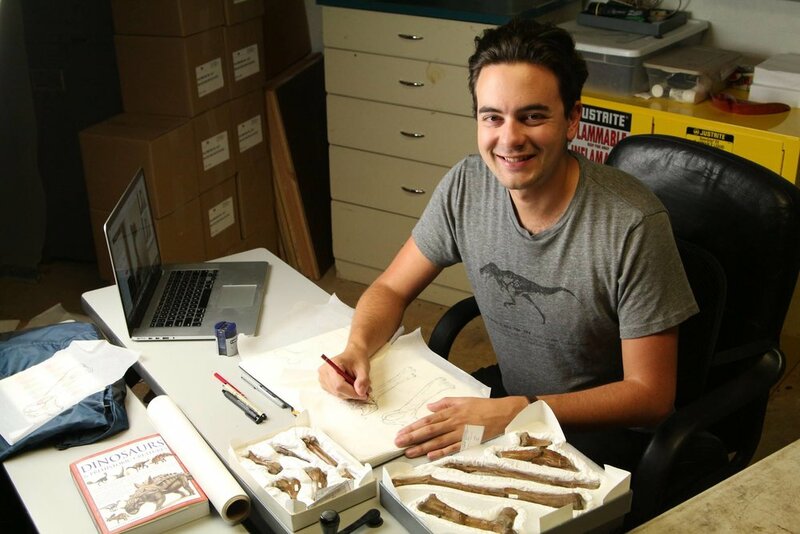 He has worked with a wide range of clients such as Science Friday, Raymond M. Alf Museum of Paleontology, and the City of Boise. If he is not painting he usually is on an adventure of some kind, whether it is a salamander hunt, a hot springs pursuit, or a paleontology dig. Paula Lucas is best known for her illustrative animal portraits and her black and white ink drawings. 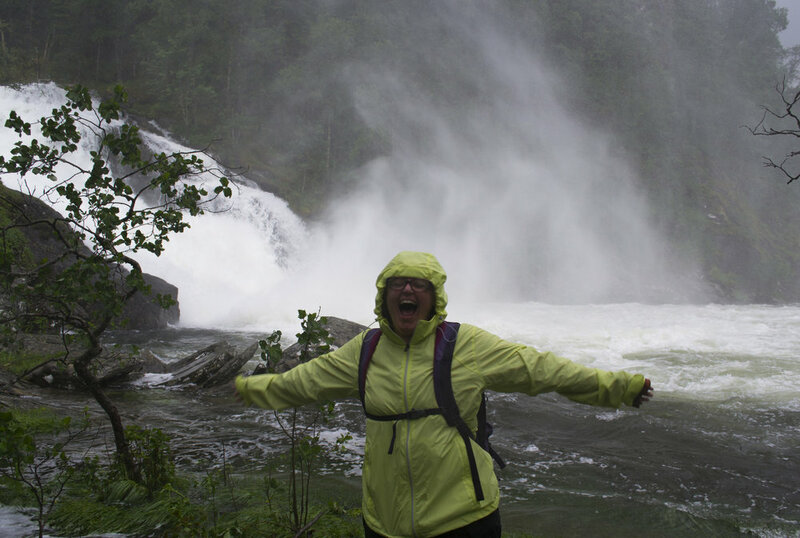 Born and raised in New Zealand, she moved to Scotland in July 2017, where her love of nature and the outdoors continues to grow. 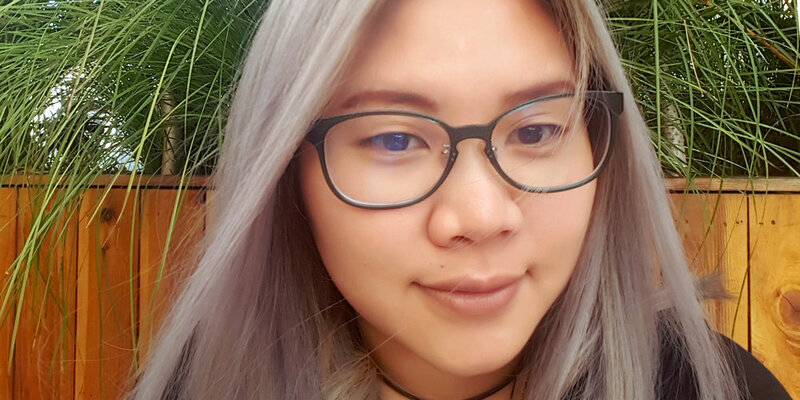 Paula studied 3D animation in Auckland, New Zealand, and has been working in the Games' Industry since 2013, though outside of working hours most time is spent on illustrative work. Paula would like her work to inspire viewers to reconnect with the natural world, as she feels there is a growing disconnect between people, modern technology and the land. Katherine Kuehne is an illustrator who lives and works in Austin, Texas. As a child, nothing made her happier than daydreaming about new places, grand adventures and mythical worlds. This is the inspiration that has kept her art moving forward into what it is today. Showing the world all her fantastical daydreams is also what she does best. Creating new characters and the worlds they inhabit, is her favorite thing to do as an artist. Professionally Kuehne aims to make children’s book illustrations, but her real passion is to make art for anyone who feels young at heart. She wants her art to resonate with people of all ages and hopefully bring a little joy and whimsy into everyone’s lives. Diana Cheren Nygren is a fine art and portrait photographer based in Brookline, Massachusetts. In her work, she seeks out small uncanny details both in everyday settings and extraordinary ones. 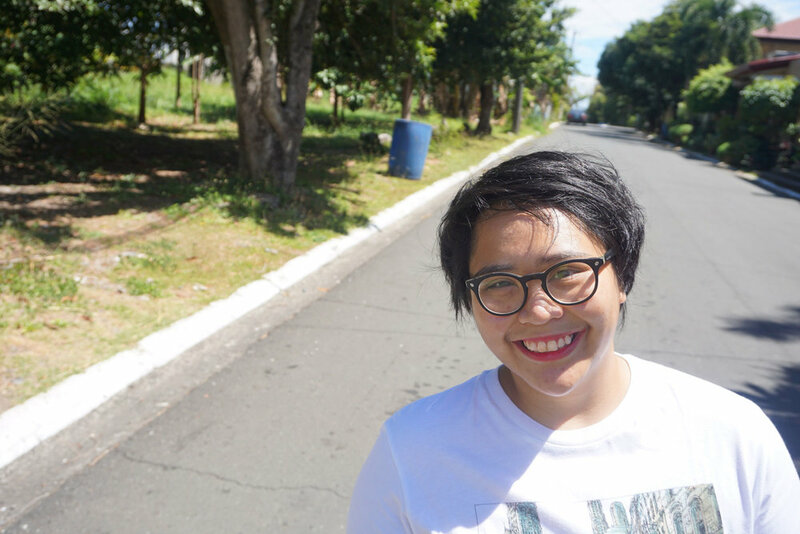 She aims not for the most posed shot, but one that captures the imperfections and idiosyncrasies that make people and places beautiful. Forged in the fires of the Asia and the Middle East before being tempered by the cold of the Great White North, John Dellomes is an illustrator/graphic designer based in Toronto, Ontario. Armed with a BAA (Illustration) from Sheridan College as well as a Graphic Design and Advertising diploma from Humber College, he battles the forces of evil who insist on putting pineapple on pizza. When not keeping the world safe, John currently works primarily in licensing design, making puzzles, boardgames, and everything in between. He basically gets to be a gigantic nerd all day. Enjoying everything from books, to food, to Lego, to video games, and movies - John does have one weakness. He is in a constant struggle for dominance with his pet rabbit. Kim Bogeman is an illustrator and aspiring ceramic artist focusing on playful color and surface exploration. Her work is a mixture of repeating motifs, illustrative porcelain vessels, and tiny narratives that explore the everyday as extraordinary. She currently lives in a Minneapolis attic with her rescue cat Toulouse, drinking large volumes of tea and coffee. She spends her time camping, traveling, and documenting vintage lettering and sign painting. Kim has over five years of product design experience and currently works as a textile designer on Cat & Jack for Target. To keep the side hustle going strong, she runs an online shop and is currently developing her first line of functional ceramics. Brandon Bird is known for strange pop art visions which combine a love of traditional drawing and painting media with topics such as Sears and Jerry Orbach. After graduating from the University of California, Santa Cruz, he spent two years as an artist-in-residence at Cornell. Now based in Los Angeles, he uses the tools of the internet to maintain and grow an artistic practice, from offering subscription boxes for longtime fans and patrons, to crowdfunding more ambitious projects, to doing the occasional illustration for clients such as Vice, Bloomberg, and DC Comics. His first book, Brandon Bird's Astonishing World of Art, is available from Chronicle Books. JiaLing is a Malaysian Chinese born artist and producer based in the Bay Area. Her passions lie in art, culture, literature and photography ; all of which serve as the basis to her conceptual process for creating her art pieces. Stephanie Hovden is a queer cartoonist, designer & illustrator living in the Bay Area of California. They are passionate about media geared toward children & YA that feature girls, women and the LGBTQ+ community. Stephanie also has a great love for animals & nature which often appear as themes or characters in their work. Stephanie is currently working on a comic called Wolf Years as well as short form comics & illustration. 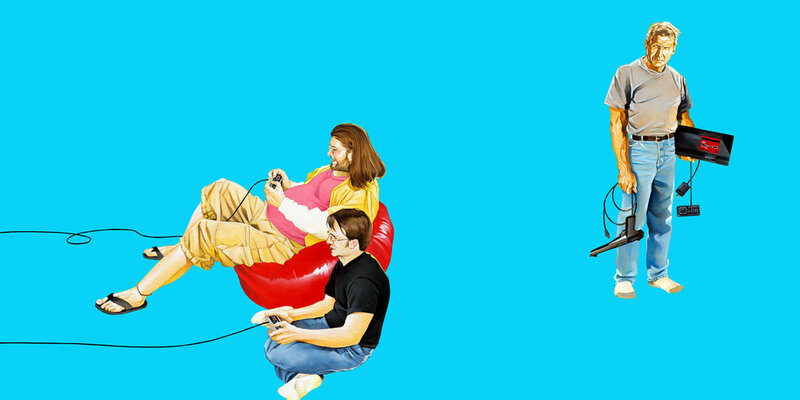 Evan is a cartoonist and illustrator working in Los Angeles. He was the art director of Amazon Studios' Danger & Eggs and is currently design supervisor on Nickelodeon's upcoming series, Pinky Malinky. 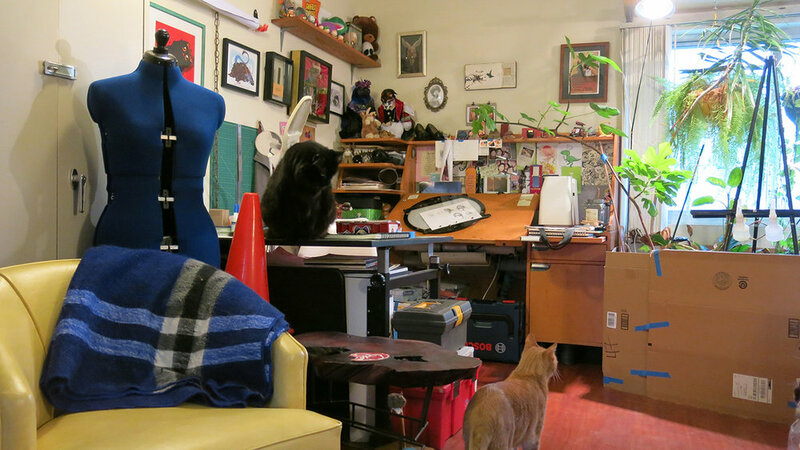 In his free time, he makes comics about wizards, mecha, and kitty cats. Although originally from Cupertino, Nicole's heart belongs to the city of Los Angeles where she currently resides in a small apartment with several large cats. Since 2005, she has been a Technical Director on the TV show South Park. 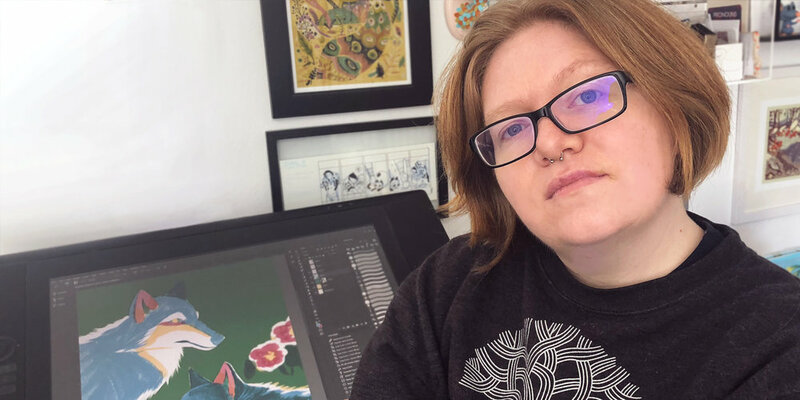 She has worked on over 100 episodes there, including four Emmy Award winning episodes, as well as the video games The Stick of Truth and Fractured, But Whole. A life long love of both art and science can be seen in her work and she is endlessly curious about the world around her. 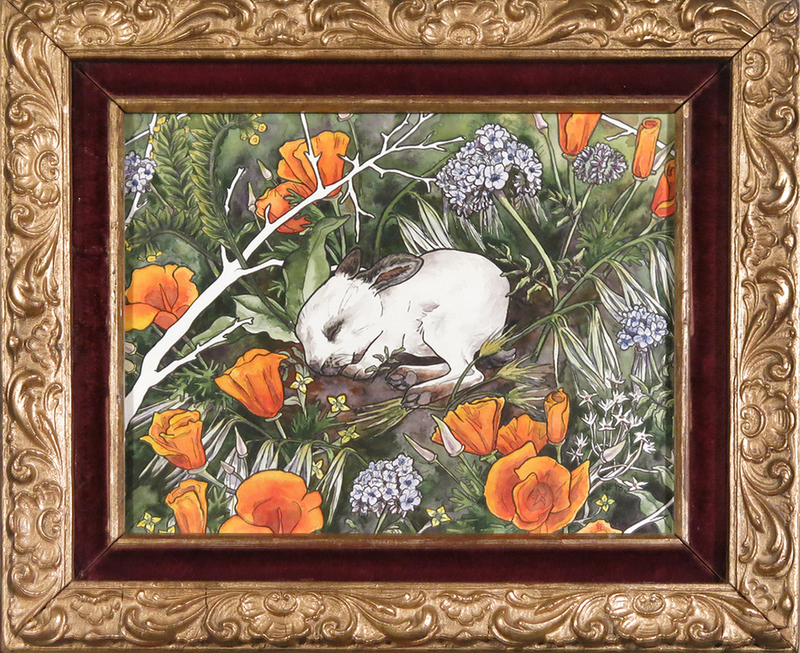 She is a current resident artist at The Hive Gallery and Studios in downtown Los Angeles. Most of the time she sticks to drawing and painting, except when on a whim she decides to build three foot tall animatronic monsters that unnerve her house guests. Amanda Ware is an illustrator and printmaker based in Chicago, IL. Due to her intrepid upbringing, she has always had a fondness of wandering off and perhaps climbing a tree she's too afraid to descend afterwards. As a result, her work primarily focuses on specimens she finds, cycles (life cycles and phenology) and rituals. She is also an amateur preservationist and enjoys making wet specimens as well as scavenging for bones, fresh corpses or whatever she can get her hands on. Don't worry, she always has gloves on hand (ba da ching).